U.S. agriculture has plenty of financial reserves to get through the worst drought in more than 50 years, the top regulator of U.S. farm banks says. But Leland Strom, chief executive officer of the Farm Credit Administration, said the drought now affecting more than half of U.S. counties has set off alarm bells across the government as grain prices soar, livestock and ethanol and dairy producers are squeezed, and food inflation fears rattle economic planners. "This has a potentially longer term impact because of that 3, 4, 5 percent rise in food prices," Strom told Reuters in an interview, referring to recent food inflation estimates by the U.S. Agriculture Department and Federal Reserve. "I don't think it's very often that Treasury officials talk inside the halls of the Treasury about agricultural issues every day. But I think they are doing that right now." Strom, who took over leadership of FCA in 2008 just months before the U.S. financial crisis shook the economy, has guided the government-sponsored entity (GSE) to its strongest financial position in history. FCA oversees the Farm Credit System (FCS) -- a network of 85 banks and associations across the country with $180 billion in loans that account for about half of all lending to U.S. farmers. FCS has also built up a capital reserve of $32 billion. But Strom, whose term ends on October 13, said that looking ahead he was concerned about the climate - both the political and the environmental. This summer's stalemate in Congress over finishing a new five-year U.S. farm bill does not bode well for negotiations on big tax hikes and spending cuts due at end-year, especially with the November election hardening postures in Congress, he said. "I know the staffs of the ag committees are supposedly back in Washington working furiously while all the members of the chambers are out on the August recess," Strom said. "They have got 12 or 13 legislative days on the calendar between now and the election. That's not a big time window for them to finish a farm bill." The current farm bill expires on September 30. "For farmers and ranchers the only thing they really ask for is: give us certainty so we know and can plan to put in this coming fall's wheat crop, plan for next spring's corn and soybean crop, rice crop. Give us some idea of certainty," said Strom, who owns a farm in northern Illinois. 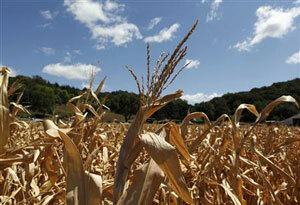 He said farm bill politics injects more doubt for investors following the first U.S. federal debt downgrade last year. "When I look at the European Union debt situation and our fiscal cliff looming here at the end of this year and what potential market disruption could occur down the road, I'm quite concerned as a regulator that we need to get our house in order in the U.S.," Strom said. FCS raises funds through debt securities, not deposits, so Strom is worried that foreign and domestic investors will hammer U.S. securities including GSE notes if Congress does not act. "The lame duck is going to be a perilous time for our economy and agriculture," Strom said of post-election talks. Strom, a Republican appointee of George W. Bush in 2006, has generally earned high marks from both parties in Washington. FCS's robust earnings and financial strength have stood in stark contrast to its fellow GSE's, Fannie Mae and Freddie Mac. But Strom said the farm boom of recent years - fed by exports and ethanol, which has boosted farm land prices to new records - has been aided by extraordinarily low interest rates. So he worries that any sudden rise in rates would hurt farm finances. A sudden policy change on ethanol, now under political attack for causing soaring corn prices, is another worry. But Strom did not expect any ethanol changes before the election. "It's a discussion that is going to keep churning," he said. "If we go into next year with a drought still biting at the Midwest, I'm not sure how they can go on and not do something." Strom said FCA was carefully monitoring farm land loans but banks and farmers were much stronger now than when the last farmland bubble "popped" in the 1980s. "Underwriting standards have been tightened. The system is not exposed to a downward draft in land prices," Strom said. "Land prices could certainly come down. Our estimates are they could come down 20 to 30 percent in value before you start to see some stress emerge in the lending sector." Strom said he was touring Farm Credit banks this week to review loans in drought areas. Lending for livestock, dairy and poultry producers and for grain hedgers were specific areas being examined. FCA has made nine corrective "enforcement actions" on lenders in the last four years to address loans, he said. "Being a regulator is not a popular job," Strom said. Asked about weather risks, he declined to say whether crop insurance should be a required part of collateral. But Strom said an outlook for a third straight year of declining U.S. corn and soybean yields meant the time had come for climate change to be considered more seriously in farmer planning and budgets. "There's obviously going to be no avoiding the fact that we had the warmest July on record, the hottest summer probably in last three-four months on record," Strom said. "Dialogue is going to unfold and it's going to tie into things like global water supplies." He cited aquifers and irrigation in the central and southern Plains and Midwest as one area of concern. "The agricultural sector needs to engage in that discussion with a tone that says OK let's not dismiss it as simply the climatologists trying to scare the populace," said Strom. "Let's engage in laying out a plan that if this is long term issue, how do we deal with it?" he said. "We are just at a threshold in the ag community of engaging in a positive mind set and say let's be at the table in this discussion."